The middle eastern Pariah Dog, feral forefathers of the Canaan Dog, dates back to pre-biblical times, existing in the "Land of Canaan" where they first originated. Drawings found on the tombs at Beni-Hassan, dating 2200-2000 B.C., depict dogs which show an unmistakable resemblance to the Canaan Dog of today. The Pariah Dog was the guard and herd dog of the ancient Israelites, guarding their camps and flocks. They were plentiful in the region until the dispersion of the Israelites by the Romans over 2,000 years ago. As the Hebrew population dropped, the majority of the dogs sought refuge in the Negev Desert, a natural reservoir of Israeli wildlife. Avoiding extinction they remained mostly undomesticated, with some retaining a form of domesticity living with the Bedouin and earning their keep guarding the herds and camps. Some were guards for the Druze people on Mt. Carmel. This was the situation of the native Pariah Dog until the arrival of Dr. Rudolphina Menzel who was asked by the Haganah to develop a dog for guarding the isolated Israeli settlements and supervise the build-up of war dogs for the fighting of the War of Independence. Remembering the Pariah Dog living in the desert, she knew only the fittest would have survived the hardships of their native land. She captured specific Pariah Dog stock from which she developed the Canaan Dog breed. As a breed the Canaan Dog proved highly intelligent and easily trainable, serving as sentry dogs, messengers, Red Cross helpers and land mine locators. During World War II, Dr. Menzel recruited and trained over 400 of the best dogs for the Middle East Forces as land mine detectors, and they proved superior to the mechanical detectors. After the war, Dr. Menzel dedicated her time to helping the blind and in 1949 founded The Institute for Orientation and Mobility of the Blind, the only one of its kind in the Middle East. The entire Canaan Dog breeding program was concentrated with the Institute where a solid foundation of kennel-raised Canaani was established that carried the name "B'nei Habitachon." The breed was first recognized by the Palestine Kennel Club, the forerunner of the Israel Kennel Club. By 1948, there were around 150 Canaan Dogs registered in their stud book. On September 7, 1965, the late Mrs. Ursula Berkowitz of Oxnard, California, imported the first four Canaan Dogs for the establishment of the breed in the U.S. At that time the Canaan Club of America (now known as the Canaan Dog Club of America) was formed and Stud Book records were kept from these first imports. On September 9, 1996, the Board of Directors of the American Kennel Club voted to accept the Canaan Dog into the AKC registry and named the Canaan Dog Club of America as the "Parent Club" for the breed. On August 12, 1997, the Canaan Dog became eligible to compete in the Herding Group. 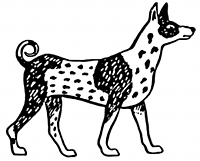 Beni-Hassan Spotted Dog, 2200-2000 B.C. Dugma, the first redomesticated Canaan Dog, on the Sebulon Coastal Plain, circa 1938, before his capture by Rudolphina Menzel, Ph.D.